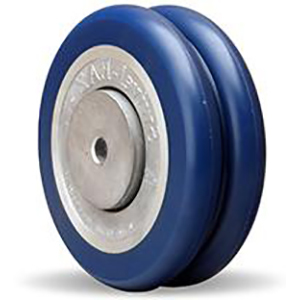 Conventional soft rubber wheels provide quiet operation and also offer good floor protection while the hard rubber wheels increase rollability. 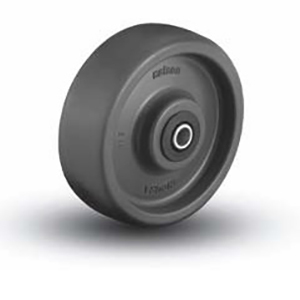 Conventional hard rubber wheels offer floor protection but increase rollability over soft rubber wheels. 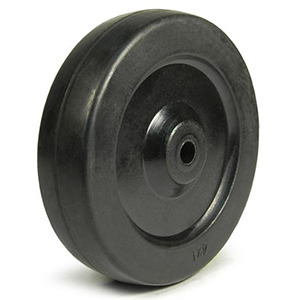 These wheels have a conventional soft rubber tread chemically bonded to a cast iron core. Soft rubber tread bonded to a solid aluminum core. Available in gray or black and in several different tread designs. 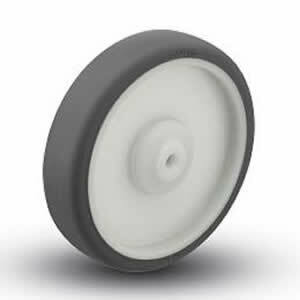 The synthetic rubber compound used in these wheels offers excellent floor protection, quiet operation and repels floor debris. Select sizes available with conductive properties. Available in multiple durometers. A specially formulated synthetic rubber bonded to a polyolefin core. 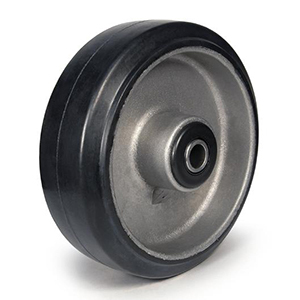 These wheels are made to withstand higher temperatures but still offer quiet operation that other high temperature wheels cannot. 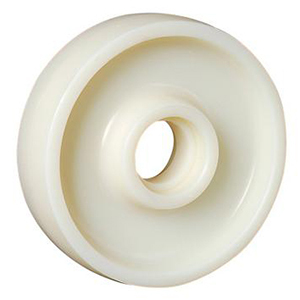 These wheels are made with closed cell microcellular polyurethane. They give a similar cushion ride to pneumatic wheels but cannot go flat. These wheels have an industrial grade tire on a steel hub. They give an extremly cushioned ride and are great in outdoor applications. 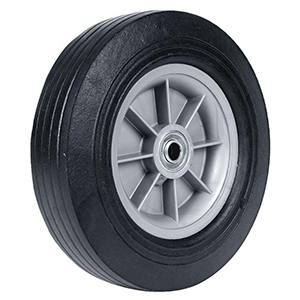 Semi-Pneumatic wheels are a harder rubber, zero pressure air-filled tire. They are most commonly used on hand trucks. Special wheel designed specifically for ergonomics. This is a patented dual wheel system that offers several different polyurethane durometers all bonded to an aluminum or polyolefin hub. Sealed precision ball bearings are standard. 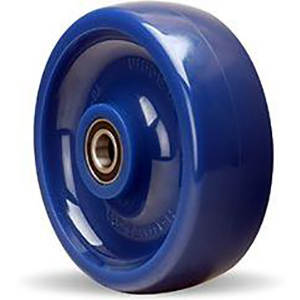 Polyurethane on aluminum wheels come in an array of styles, colors and sizes depending on your needs. They are especially useful in ergonomic and towline applications. Available in multiple durometers. 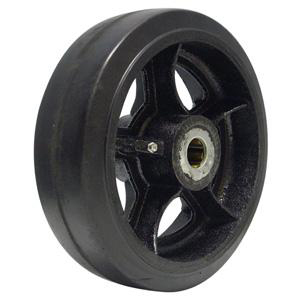 This wheel has a flat polyurethane tread chemically bonded to a cast iron core. It offers a great combination of floor protection and load capacity. Available in multiple durometers. 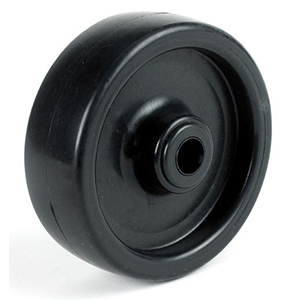 These wheels have an injection molded polyurethane tread mechanically bonded to a polyolefin core. 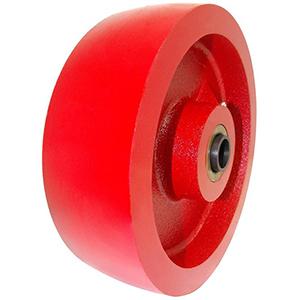 It is a less expensive alternative to solid polyurethane wheels. Available in multiple durometers. 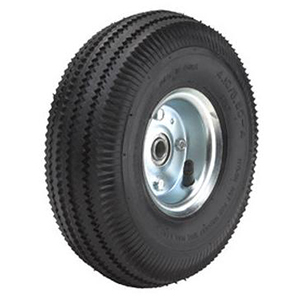 Solid cast elastomer wheels designed for towline and ergonomic applications. Standard with sealed precision ball bearings for easy rollability. Available in multiple durometers. 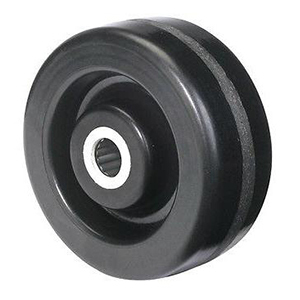 Solid polyurethane wheels are an injection molded 1 piece design. They are great in most wet and washdown applications. Available in multiple durometers. A nylon and fiberglass compound is used to make these wheels. They have excellent weight capacity, floor protection and resistance to most chemicals. Also available for high temperature applications. 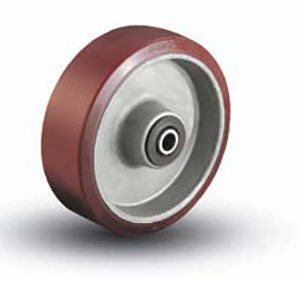 This solid nylon wheel is specially formulated with molybedenum disulfide (MoS2), machined to precise specifications and comes standard with sealed precision ball bearings. Arguably the most ergonomic wheel available today. 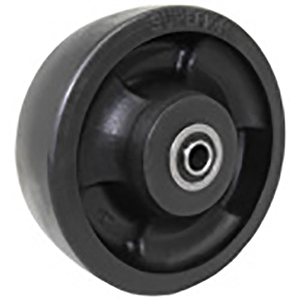 Made from macerated canvas and phenolic resin and formed under high pressure, these wheels offer the load capacity of cast iron without causing damge to your floors. 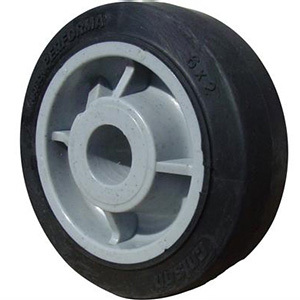 These are standard injection molded plastic wheels. 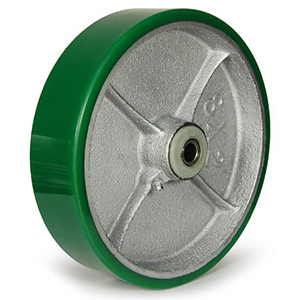 They are an inexpensive wheel used in many applications from store fixtures to food processing plants. Impervious to most chemicals, they perform well in most washdown applications. 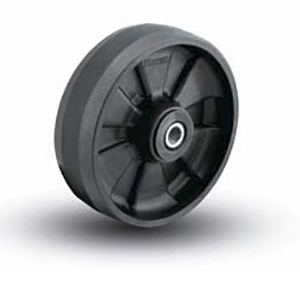 Solid cast nylon wheels offer a high impact strength and superior wearability over other plastic wheels. 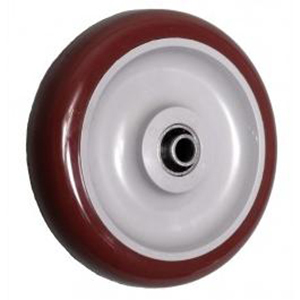 A polyolefin and fiberglass compound is used to make these wheels. They offer the same advantages as a standard polyolefin but have better wearability. 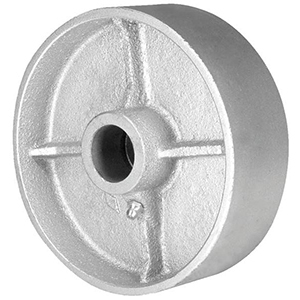 Cast iron wheels, also known as semi-steel wheels, offer a high load capacity and are also perfect for higher heat applications. Not recommended where floor protection is a concern. 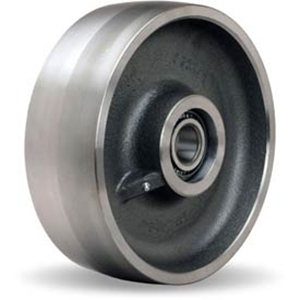 Drop forged from high carbon steel, forged steel wheels offer the ultimate in both strength and tempurature capabilities. Not recommended where floor protection is a concern. 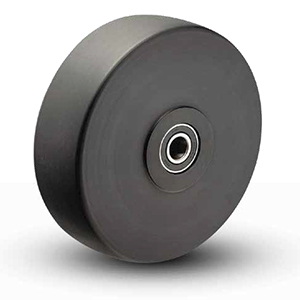 Ductile iron wheels offer the same characteristics as cast iron except with a greater load capacity than cast iron wheels without a significant increase in price. Not recommended where floor protection is a concern. 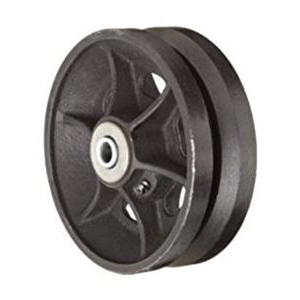 Intended to be used on inverted angle iron; these wheels can be manufactured using cast iron, ductile iron or forged steel. 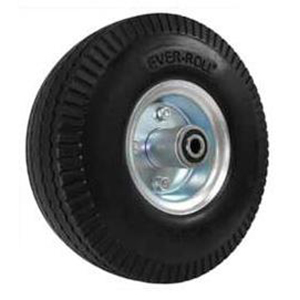 The wheel has a smooth tread on either side of the groove so they can be used on regular floors.